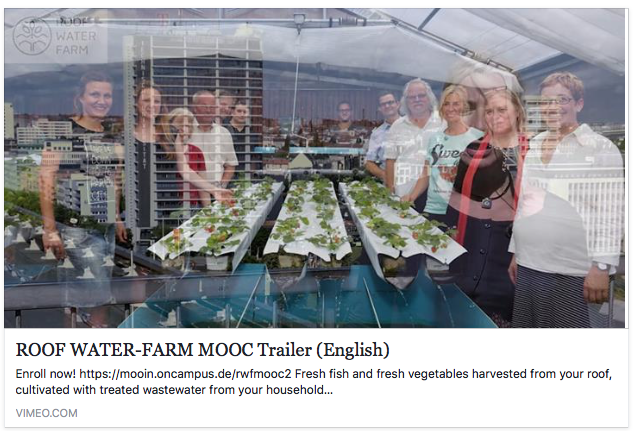 Byebye moin, hello oncampus, our MOOC mooved, enroll now! Our e-learning (MOOC) goes into the second round! WHAT? 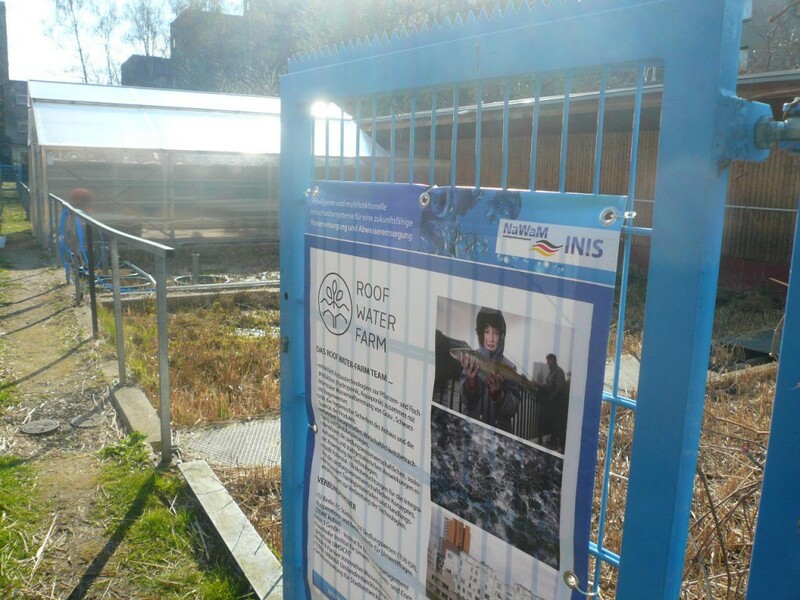 How can a ROOF WATER FARM look on a building? Which foodstuffs can be produced, which management strategies are feasible? How does this change the daily life and how do these changes affect the neighborhood? The online course presents the results of the research in short videos. It is free of charge and is open to all interested parties. Many thanks to the online teaching team of the TU Berlin! This year, our pilot plant opens its doors on 28 September 2017. Come by, get to know our technologies and products and look back with us on an exciting season! 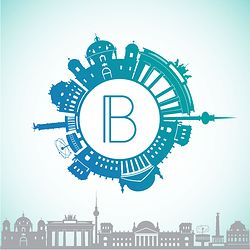 This year we are part of the Bundeskanzleramts’s open day! 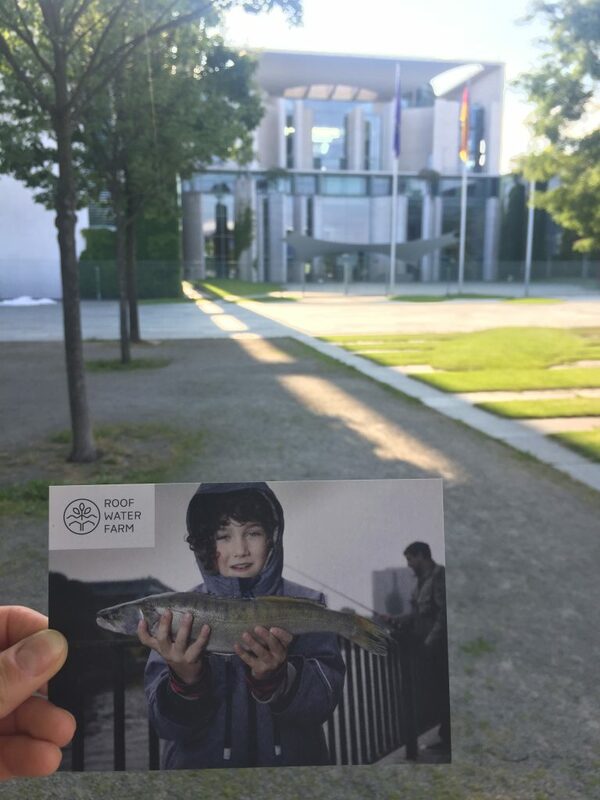 Visit us on 26th and 27th August in the garden of the Federal Government Building and get to know ROOF WATER-FARM and many other exciting projects! We will celebrate our harvest festival at the ROOF WATER-FARM pilot plant on 14 September 2017. Come by, get to know our products and technology and celebrate a successful season 2017 with us! Our E-Learning course is in preparation and will be starting in spring 2017. Visit our online-course (MOOC) from 25th April – 23th May 2017! Special thanks to the TU Berlin-E-Learning Team! Visit us at the International Garden Exhibition and at the sub.marine of the re:publica (8th – 10th May 2017)! 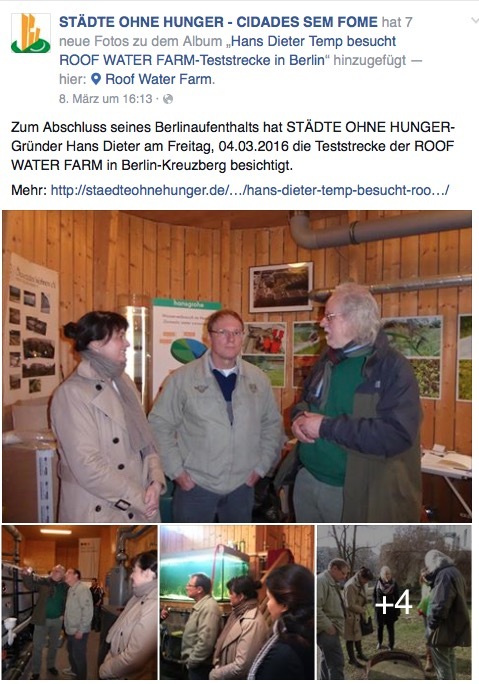 At the end of his stay in Berlin, CITIES WITHOUT HUNGER founder Hans Dieter visited the test track of the ROOF WATER FARM in Berlin-Kreuzberg on 4th March 2016. 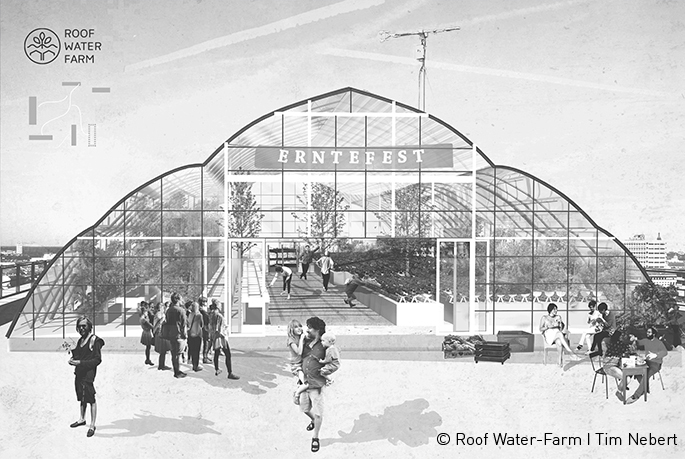 The second roof water-farm test track could start the season. 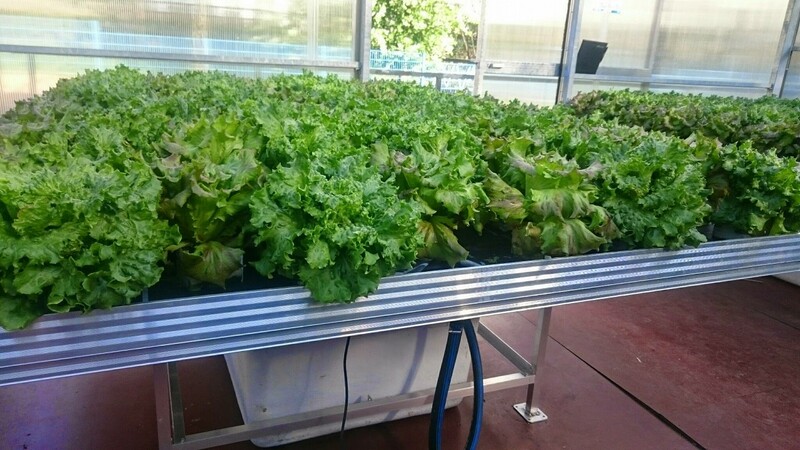 Ebbe/flow irrigation system with hydroponic vegetables nourished with liquid fertilizer from black water. 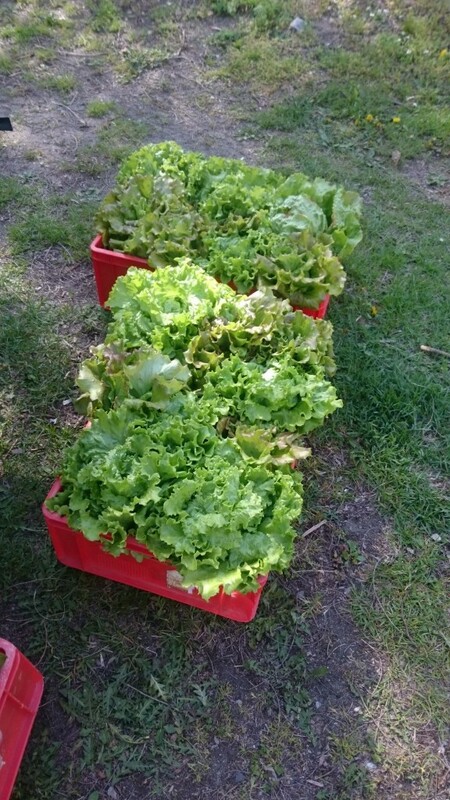 First seasonal salad 2015 from the aquaponic test track is harvested and quality checked. 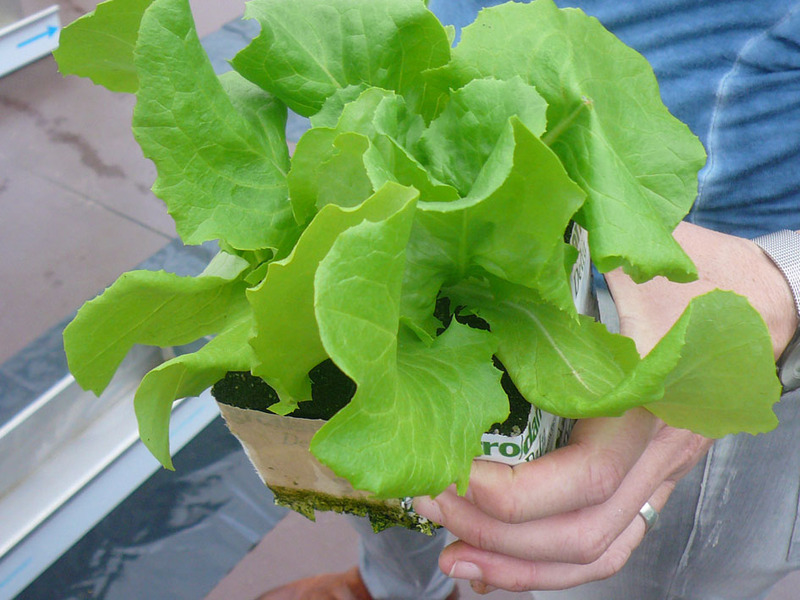 Urban mining + farming! 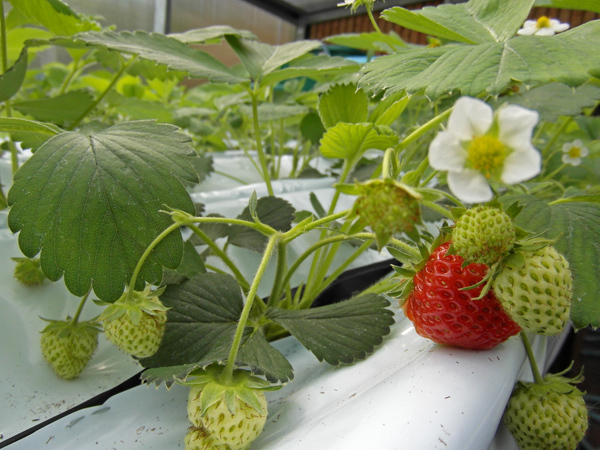 June 11th we want to invite you to enjoy the smell of the strawberry with us! 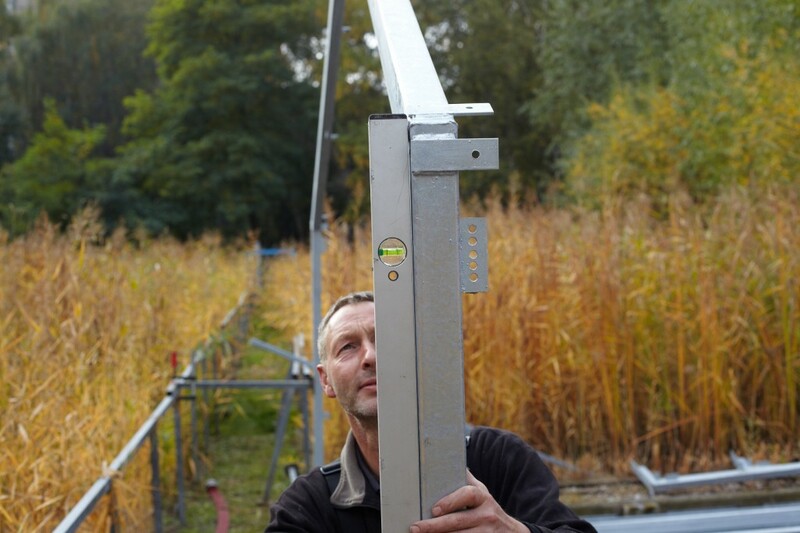 We will open our test site in the yard of Bernburger Straße 22, 10963 Berlin-Kreuzberg. It will be possible to taste our research. 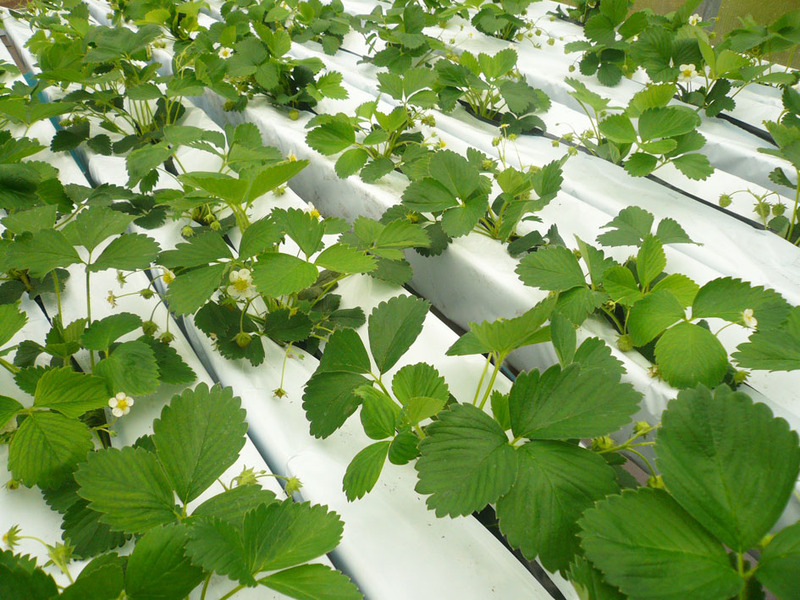 Follow with us “the flow of the process water from the pipe through the greywater treatment passing the fish farm, the strawberry and salad fields …”. 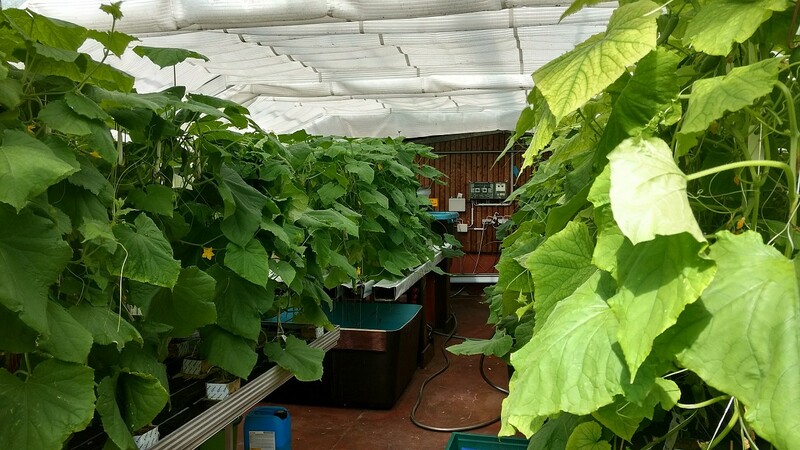 We will inform you about our current research and opportunities for building-integrated water treatment systems to irrigate and fertilize roof-top greenhouses! 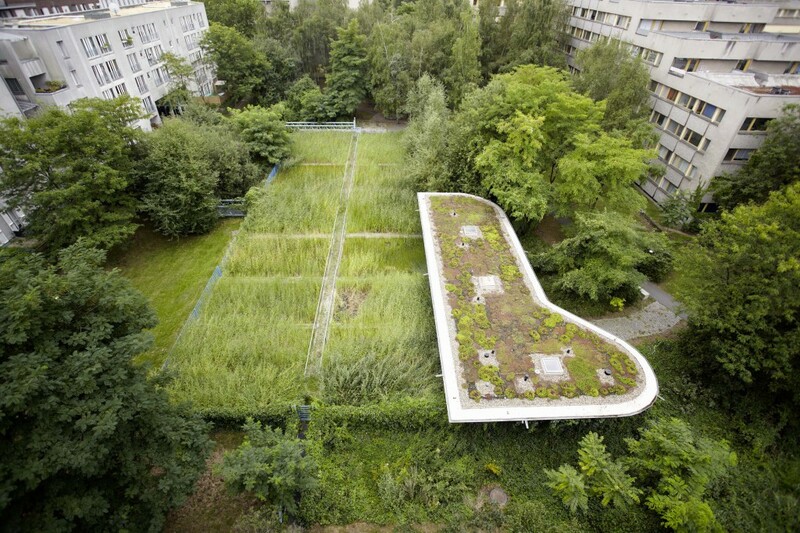 TU Berlin, Department Urban Design & Communication. Here you can download the press release (only available in german) for our strawberry celebration June 11th 2014. For any further questions please contact the project coordination. Here are some actual impressions from our running pilot. We start with wels, carp, salad and strawberry as parts of our product lineup. 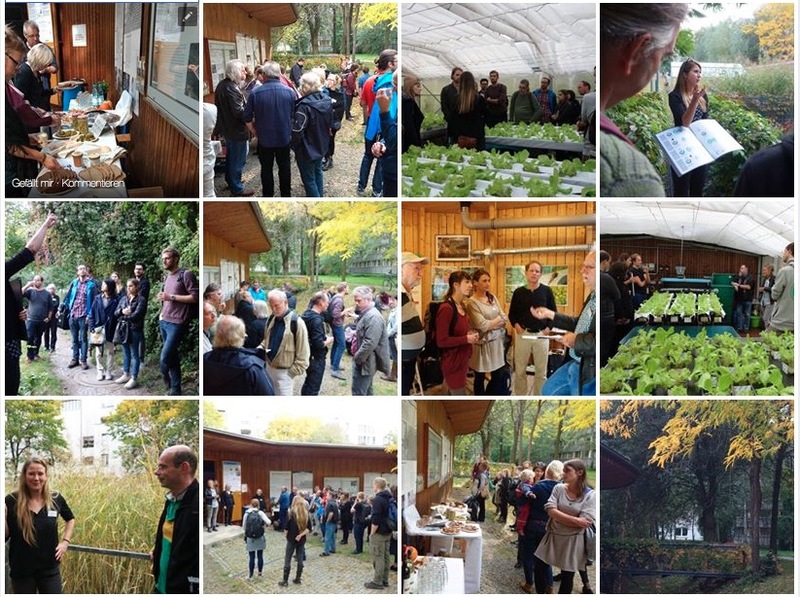 If you are interested in urban perspectives around water infrastructure, aquaponics and building integrated farming, contact us for a visit. 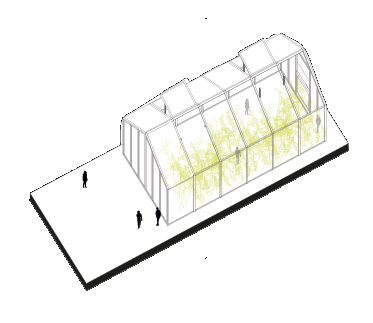 We will inform you about our current research and opportunities for building-integrated water treatment systems to irrigate and fertilize roof-top greenhouses! How cooperate aquaponic process engineering and contemporary architectural design? 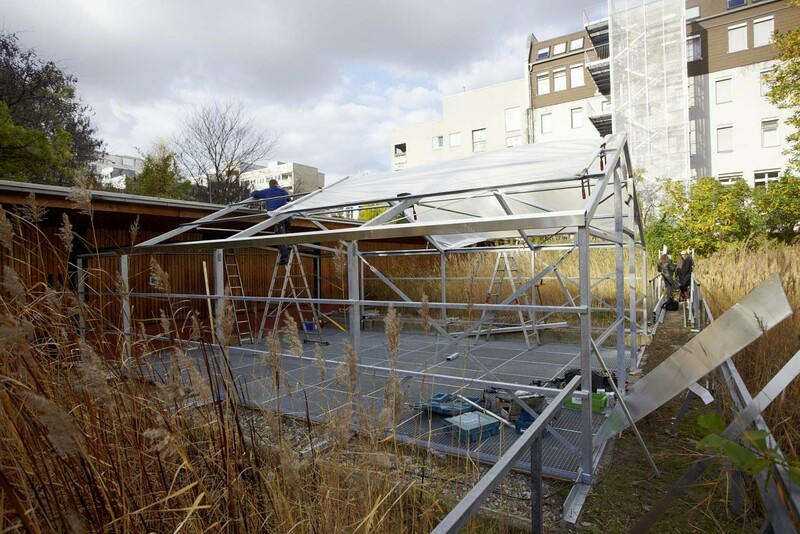 How much technology and food can carry a roof? 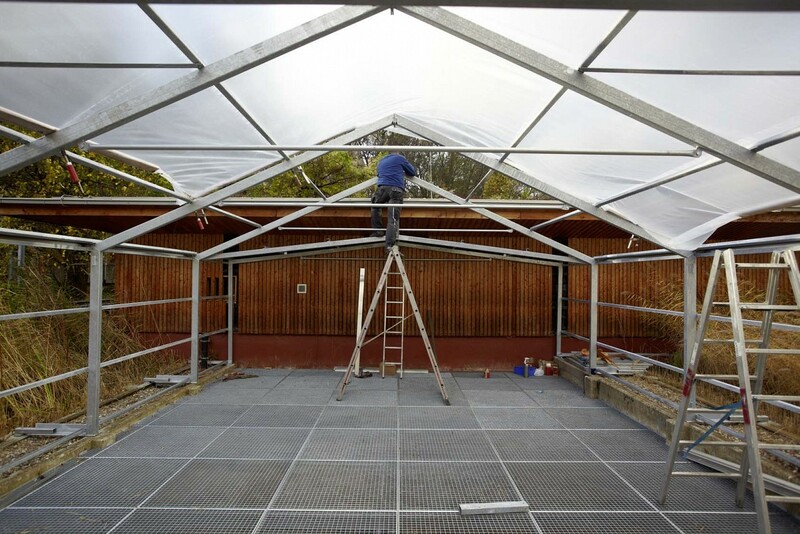 Which typical buildings can be used for ROOF WATER-FARMING? 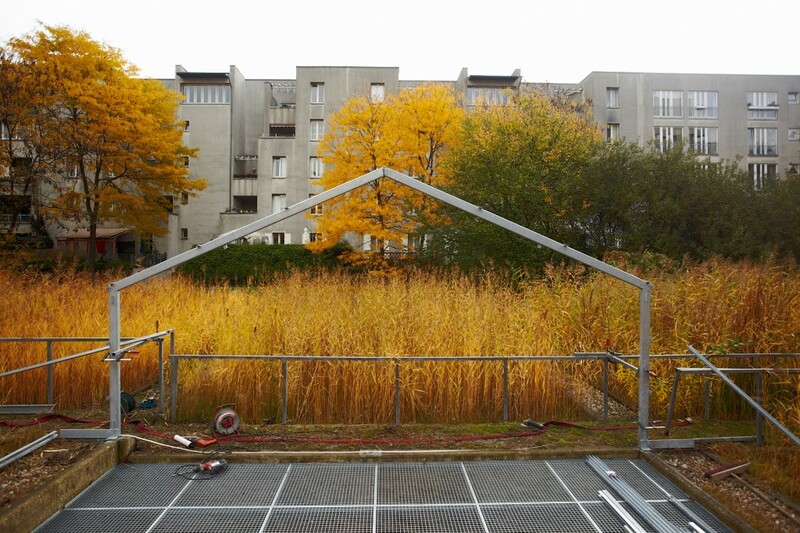 How building technologies and spaces do change with such an infrastructural transformation? Practical examples and architectural design solutions we acquire with Thomas Freiwald, office for Architecture, Berlin. The integrated water concept at Block 6 in Berlin-Kreuzberg was originally developed as a project of the International Building Exhibition 1987 as well as a model project of the Experimental Housing and Urban Development (EXWOST) research programme. 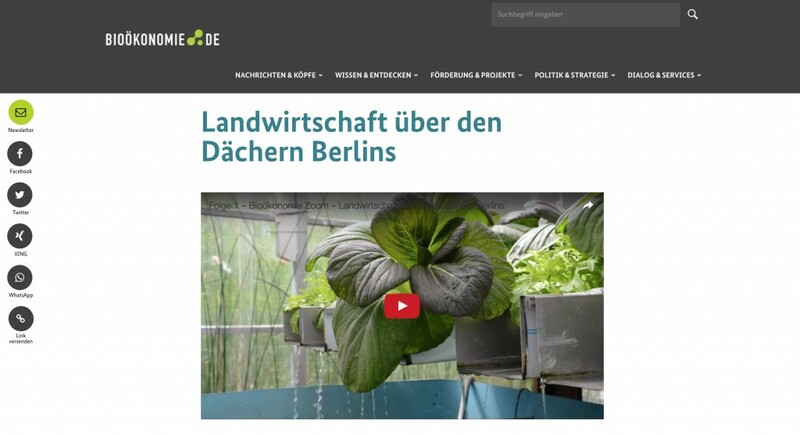 The model project was financed by Federal and State funds and is a cooperation between the Federal State of Berlin and the plant owner. 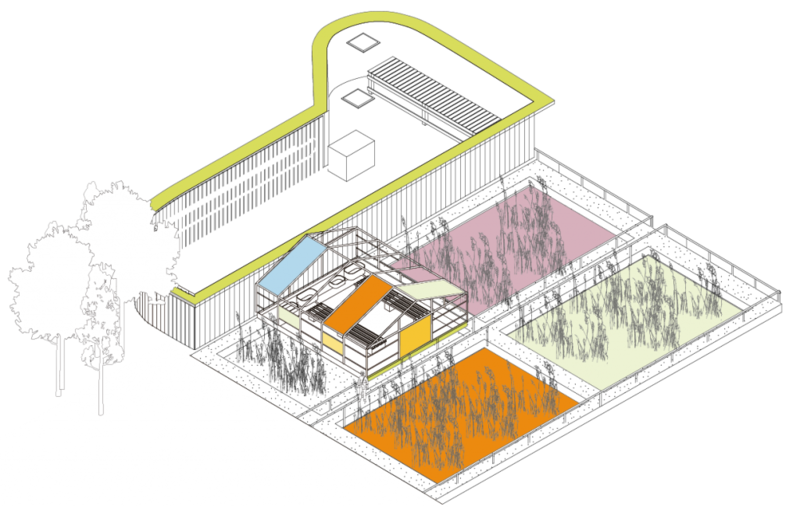 Research of different ecological building concepts has since then been implemented: Since then domestic wastewater produced by the tenants of Block 6 is separated into the two flows: greywater and blackwater. The comparatively low-nutrient greywater from bathtubs, showers, wash basins and kitchens is separated via a second water supply pipe. 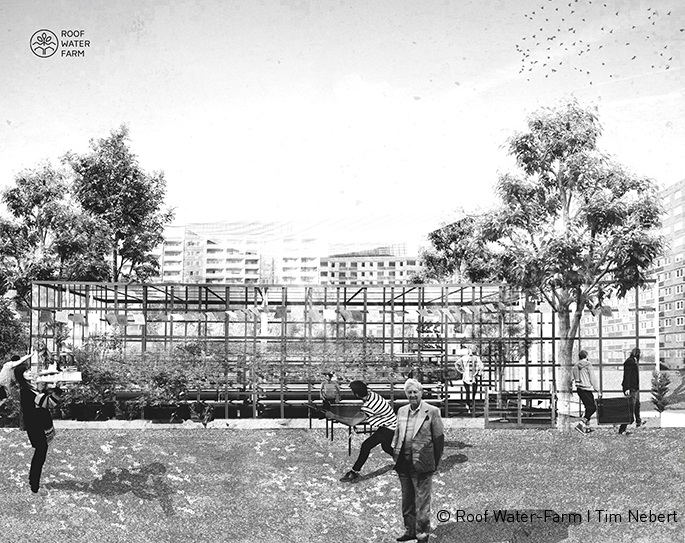 It allows the decentralized water treatment and the reclaimed water use for purposes of irrigation and open space design as well as domestic demands. To optimize the building-related water reuse by making it more viable, the water concept has been re-engineered. 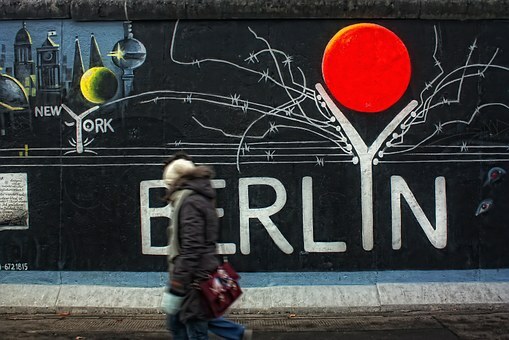 The aim of the Federal State of Berlin was, with the consent of the owner, to secure and optimize the plant as a ‘technical monument’. On the foundation of the former polishing pond of the constructed wetland located in the courtyard of Block 6 a water-processing house in eco-friendly timber construction has been built. 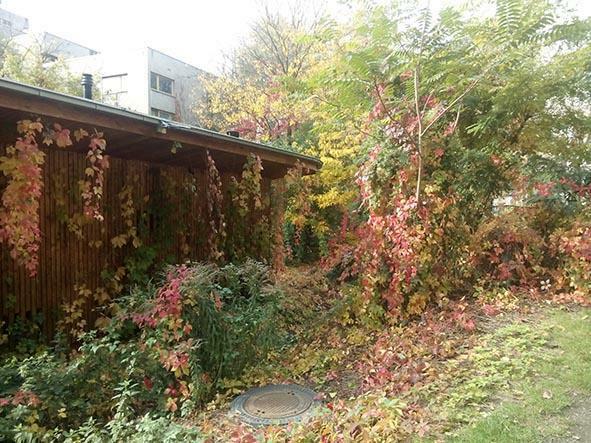 Therein the greywater of ~ 250 tenants is treated mechanical-biologically towards bathing water quality and reused to flush toilets and irrigate tenant gardens. 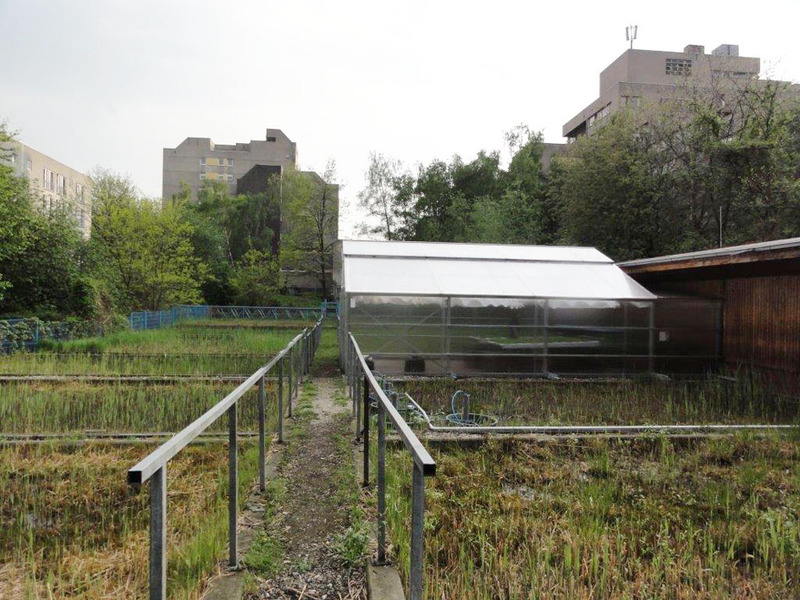 Rainwater from 2.350m² of roof surface area and 650 m² of sealed open space is discharged in the original constructed wetland. 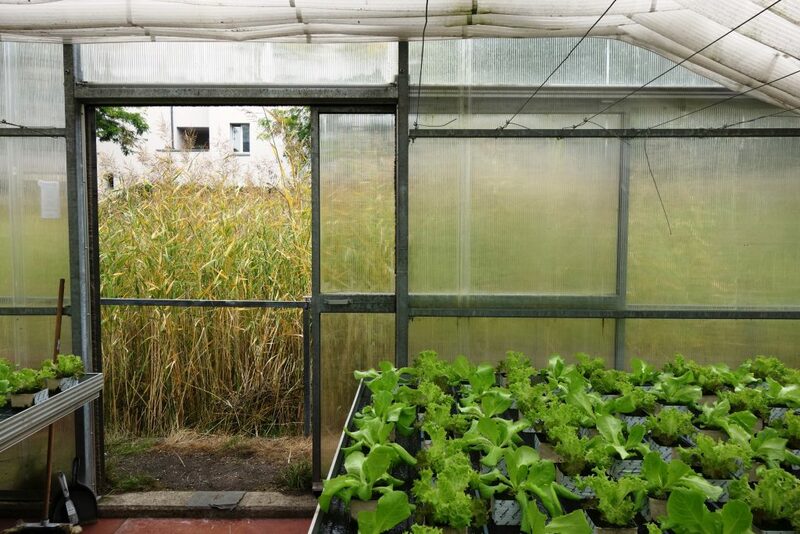 The microclimate improves via the evaporation by the plants. After heavy rain events excess water can infiltrate time-delayed via an adjacent trough. producing liquid fertilizer out of blackwater for hydroponic plant production. reference data to develop models for commercial and non-commercial operation and product marketing. Construction started in mid-October and we look forward to welcoming you!